We appeal to your generosity and solidarity! 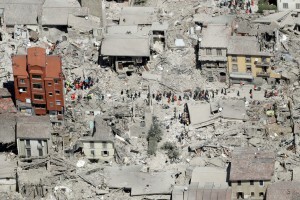 On 20 May 2012, a large-scale earthquake struck the “Emilia” region in Italy. This re gion is renowned, throughout the world, for its production of Parmesan, the flagship of the local gastronomy of registered designation. Yet, in the aftermath of this tragic catastrophe, 400,000 wheels of this cheese were damaged or destroyed – and became therefore unsaleable – and maturing rooms were severely affected, for a total value of more than 250 million euros. The whole economic activity of these local producers collapsed. Despite this disaster, producers were able to recover 12 million kilos of cheese that could be sold as part of a major solidarity operation to support the sector. On 24 August 2016, Italy was struck again, right in the centre, by an earthquake classified by experts as “out of the ordinary” , and causing nearly 300 deaths in the region of Lazio and in particular th e city of Amatrice known for the production of another cheese named Pecorino. This city, with some 1,800 affected-people, was victim, during the following months, of numerous aftershocks leaving behind damage for an amount of nearly 4 billion euros. The shepherds, artisanal producers of the Pecorino, are the ones who practically lost everything. A call was launched to help them. As soon as it heard about this tragic news, having still in mind the tremendous consequences of the earthquake suffered a few years ago, the consortium of producers of Parmesan immediately urged to make a contribution for these small producers, for each kilo of Parmesan sold. 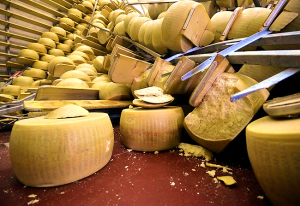 Thanks to these efforts and to the solidarity of the staff of the institutions, the facilities could benefit from the essential repairs needed to resume their operations and thus return to a normal production of Parmesan. It is in the pursuit of these efforts that the R&D responsible initiative of solidarity is integrated! In order to give, on our turn, our help, we have decided to organize a solidarity sale of Parmesan for the staff of all the European institutions, their families and their acquaintances. In the light of the initiative of the consortium of Parmesan producers, we contacted Punto Latte (link), a family-run company with a “short supply chain”, namely using only the milk of its own production for the preparation of Parmesan and which has already received several international awards for the quality of its “Parmigiano Reggiano PDO” including a silver medal for 24-month parmesan cheese at the PDO cheese competitions in 2015, 2016 and 2017 (link). 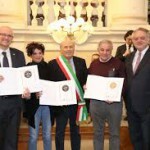 We proposed to this producer, also victim of the earthquake in 2012 and whose material damage was very heavy, to make an exceptional effort to put up for sale the Parmesan of 24 months, awarded to the PDO cheese competitions worldwide, at the price of 12.80 euros per kilo. This offer lies very much below the market price. * NB: the Parmesan will be delivered under vacuum by slices of a kilo and can be kept in the fridge for 6 months. In the same way it was done by the consortium of producers of Parmesan, we propose to add € 1.2 to the sale price (this is a proposal for a basic donation, if you wish, you can increase your contribution). For its part, R&D will add the same amount of 1.2 euros to obtain a basic donation of 2.4 euros for each kilo of parmesan sold. in turn, saw all their facilities being destroyed. Obviously, R&D will not get any benefit whatsoever from this sale will support all shipping cost and the management of this action will be carried out only by R&D volunteers. 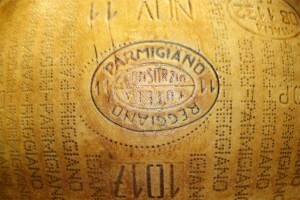 Parmesan delivery is scheduled for the last week of June. You will be informed in due course about the practical ways to collect your orders from our volunteers. including all details of the sales, as well as the amount and the exact destination of the donations collected.